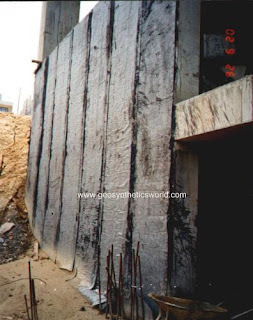 On the basement walls of a big business area with many buildings an elastic special drainage product was used. Drainage sheet called Enkadrain was elastic with 2 filter fabrics on both sides and has a drainage core between them. It was easy to cut and put it on the waterproofing. 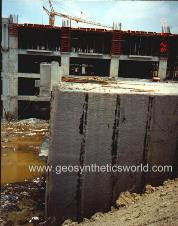 Liquid bitumen type waterproofing was used. So also the overlaps were glued with that waterproofing product. After the job they backfilled carefully. Using geocomposite drains ar much easier than filling the area with gravel.